Today, THQ have announced that WWE ’12 is in development. The electrifying rebirth of the renowned WWE flagship videogame franchise. Featuring a bigger game, badder presentation and better simulation-based gameplay, WWE ’12 will include long-awaited and critical core gameplay improvements, the most creative and extensive feature set to date and a visceral, edgy and polished presentation. WWE ’12 is currently in development for the Xbox 360, PS3 and Wii with a scheduled release timing of November 2011 in the UK. More info on the new game below! WWE ’12 will offer players the opportunity to engage in the WWE experience through the new Predator Technology™ dynamic gameplay system, which is poised to deliver the most fluid, dynamic, authentic and action-packed WWE simulation experience to date. Included are the new Breaking Point submission system, new Attributes and control layout as well as significant improvements to other key gameplay systems, including Momentum and Stamina. WWE Universe Mode 2.0 will generate new and more impactful elements of unpredictability based on player decisions, while dynamic visual changes to gameplay presentation, including new animations, camera positions, lighting and improved rendering, will set the tone for delivering an exceptional simulation of WWE programming. WWE ’12 will feature the franchise’s best-in-class creation suite, enabling players to develop and customize their own Superstars, entrances, finishing moves, storylines, Highlight Reels and other all-new capabilities to be announced later this year. As well, the popular Road to WrestleMania Mode will enable players to explore compelling new storylines and major gameplay improvements. 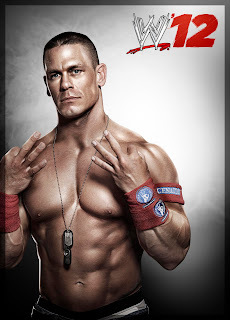 WWE ’12 will also boast one of the largest rosters of WWE Superstars, WWE Divas and WWE Legends in franchise history, including cover Superstar Randy Orton, John Cena, The Miz and the debut of Alberto Del Rio. WWE ’12 will be playable for the first time at the Electronic Entertainment Expo (E3), booth #2001 in the South Hall of the Los Angeles Convention Center, from June 7-9, 2011. In addition, prominent WWE personalities are slated to attend E3 in support of the new WWE ’12 experience. WWE Superstar Alberto Del Rio and WWE Diva Kelly Kelly are currently scheduled to appear on Tuesday, June 7 from 3:00 p.m. to 4:00 p.m., while WWE Superstar The Miz is currently scheduled to appear on Wednesday, June 8 from 2:00 p.m. to 3:00 p.m.
See artwork from the new game featuring Alberto Del Rio, John Cena and the Miz! Also screenshots from the new game!